Home › Electronics › Sodial(R)Usb 2.0 50.0M Hd Webcam Camera Web Cam With Mic For Pc Laptop Comput..
Sodial(R)Usb 2.0 50.0M Hd Webcam Camera Web Cam With Mic For Pc Laptop Comput.. Compatible with USB 2.0 / 1.1. Button on the camera is just for decoration. SODIAL is a registered trademark. ONLY Authorized seller of SODIAL can sell under SODIAL listings. Our products will enhance your experience to unparalleled inspiration. 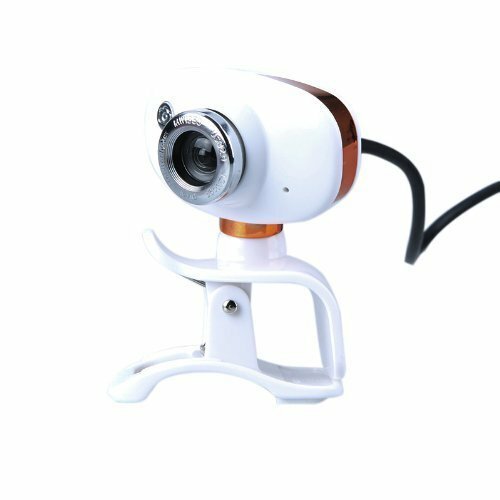 SODIAL(R)USB 2.0 50.0M HD Webcam Camera Web Cam with MIC for PC Laptop Computer Orange & WhiteUSB interface, plug and play. Supported operating system: Windows 2000/XP/Vista/Win 7, Mac OS 10.4.6 or higher (but if your system doesn't support plug and play, please install the software CD).360 degrees rotatable function, all angle is available. Built-in microphone, supports AIM, Net meeting, AOL, MSN Messenger, Skype, etc.High Resolution CMOS sensor gives perfect image quality. Manual adjustable focal length.Image sensor: CMOS Maximum dynamic pixel: 5.0M pixels (352x288, 640x480, 1280x1024, 1600x1200, 2048x1536, 2560x1920) (with software boost/ upscaling) Maximum static pixel: 50.0M pixels (2560x1920, 2848x2800, 3648x2736, 4000x3000, 6000x8000) (with software boost/ upscaling) The focal length: 8cm-infinity Frame rate: 30fps S/N ratio: Above 48dB Cable length: Approx. 115cm / 3.77ft Item size: Approx. 6.5 5 5cm / 2.6 2.0 2.0in Item weight: 57g / 2.0oz Package Included: 1 x Webcam 1 CD driverNote:Light shooting and differnent displays may cause the color of the item in the picture a little different from the real thing. The measurement allowed error is 1-3cm.